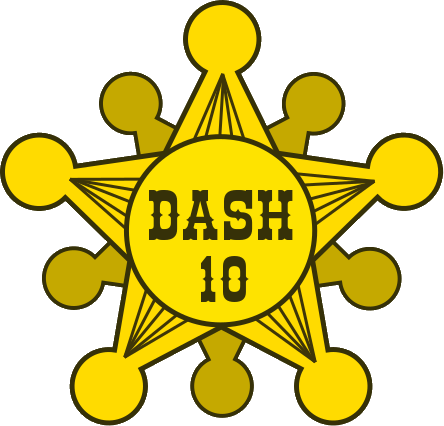 DASH 10 took place on September 22, 2018. Here are the results for Standard and Expert levels. DASH 10 puzzles are available for download, sized for either letter or A4 paper. Each zip contains the DASH 10 puzzles in both Standard and Expert levels, as well as an Instructions PDF with details on printing and materials. Kickoff skit (PDF, 55 KB) – to help set the scene for the hunt, you can have two members of your team perform this brief skit. DASH is designed to be played by a team of 3-5 people. You'll find it handy to have scissors and tape for DASH 10. We recommend using ClueKeeper to complete your DASH 10 experience. Some of the story is revealed via ClueKeeper as puzzles are solved, and it is helpful for confirming partial solutions and providing hints. For a small fee, you can purchase a version of the DASH 10 ClueKeeper hunt specifically designed for use with the files above. Use the Find Hunts button in the app or on the website and choose the Standard or Expert hunt based on which level you wish to play. (See the FAQ page for guidance on choosing a level.) Note that the ClueKeeper purchase is for an entire team, not a per-person cost. DASH 10 used a few physical items, described below. We have a few sets of physical items that are available while supplies last. Price is $20, including shipping to a US address. (International shipping is expensive, making that impractical in most cases.) Contact dash10 if you would like to order items. Coins. For the play-at-home version, the coins are shown on one of the puzzle pages. If you are using the physical coins, you will find it useful to know about a minor production issue. Deck of cards. You can order a deck of cards from Drive Thru Cards. Click on a link below for information on the event in that city.